Being a Person Dedicated to Quality has been a part of Nelson Agholor's life since he helped us open the very-first PDQ in Tampa seven years ago. Agholor has since left Tampa to become an All-American wide receiver at USC and more recently a Super Bowl Champion last season with the Philadelphia Eagles, and continues to give back to the community in his hometown of Tampa and in the Philadelphia/South Jersey area. 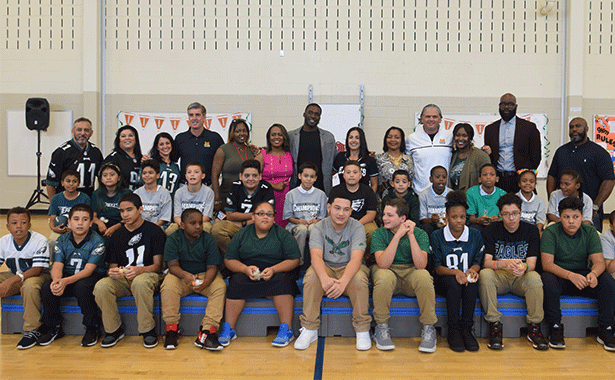 On Monday, our South Jersey PDQ team partnered with Agholor to kick off a year-long reading initiative with the Camden City School District. The Building Reading Muscles partnership will encourage students to meet reading goals throughout the school year and include surprise visits from Agholor, prizes, free food from PDQ and more. Agholor, who is a Brand Ambassador for PDQ, spent the afternoon visiting with students at the Dudley Family School, answering questions from students about his football career, his life and of course the reading program. He also spoke at a pep rally for nearly 400 students, with the kids being treated to Honey Butter sandwiches and cookies from PDQ. "Each kid can use this reading program as an advantage to dream big," said Agholor. "If a kid picks up a book, he's going to pick up a book that'll inspire them to be something in the future. This is a bridge to something great." "Nelson has been a Person Dedicated to Quality since he helped us open the very first PDQ seven years ago,” said Nick Reader, PDQ Co-Founder and CEO. “Nelson is making a difference in the lives of youth in the Delaware Valley and in his hometown of Tampa. We are proud to partner with him and the Camden City School District on this important reading initiative." Agholor will work with the District throughout the year to motivate students to reach reading goals during each marking period. Students can earn coupons good for free PDQ food and Grand Prize winners may also receive an autographed item from Agholor or even a visit from him to their classroom. PDQ, with 65 restaurants in 11 states, has two Delaware Valley locations in Cherry Hill and Sicklerville. Since 2013, the graduation rate in Camden schools has gone up by 17 points, and drop outs have fallen in half. The program will reach 7,000 students in Kindergarten through 12th grade in 15 schools in Camden and the District is making steady progress in reading and math achievement, but still lags behind the state average. With a student population who all receive free or reduced lunch, the District’s educators work hard each today to help students close the achievement gap and realize their potential. Acting State Superintendent Katrina McCombs was appointed to lead the District in June 2018, and is committed to accelerating her students’ achievement in reading and math through innovative instruction and finding creative ways to incentive and motivate all students to reach their potential.